Are you part of the Firestorm? On Saturday, August 22nd, tens of thousands of pro-life Americans came together to form a National Protest of Planned Parenthood at hundreds of Planned Parenthood facilities all across the U.S.! That is nothing short of amazing. MFC came together with other Minnesota pro-life organizations, including our friends at Pro-Life Action Ministries, Students for Life of America, Human Life Alliance, Minnesota Citizens Concerned for Life, and Silent No More Awareness Campaign to co-sponsor a local Planned Parenthood Protest at the mega Planned Parenthood in St. Paul...and over 4500 of you, along with pro-life Minnesota legislators, Dr. John Piper, Rev. Denise Walker, and Pastor Sergio Amezcua attended! WOW! Looks like this MN Protest ended up being the largest in the country on Saturday! Way to go! We are so grateful! Thank you! And, even better, the Name of the Lord Jesus Christ was honored throughout the entire Planned Parenthood Protest in St. Paul! We wanted to share some highlights from the St. Paul National Protest of Planned Parenthood with you! "Planned Parenthood says it's necessary for women's healthcare, when in Minnesota alone there are 18 Planned Parenthood facilities compared to 173 women's health clinics who actually DO provide mammograms, don't practice abortion, and are far more deserving of the funding! We clearly don't need Planned Parenthood! Finally, we now know that Planned Parenthood harvests body parts from aborted babies—sometimes without the mother’s permission and sometimes when the baby is still alive—and sells them for profit. Why on earth is this type of barbaric practice allowed in 2015. We don’t need Planned Parenthood!" To read Autumn's entire remarks, CLICK HERE. To watch a Kare11 interview with Autumn & coverage of the St. Paul protest, CLICK HERE. 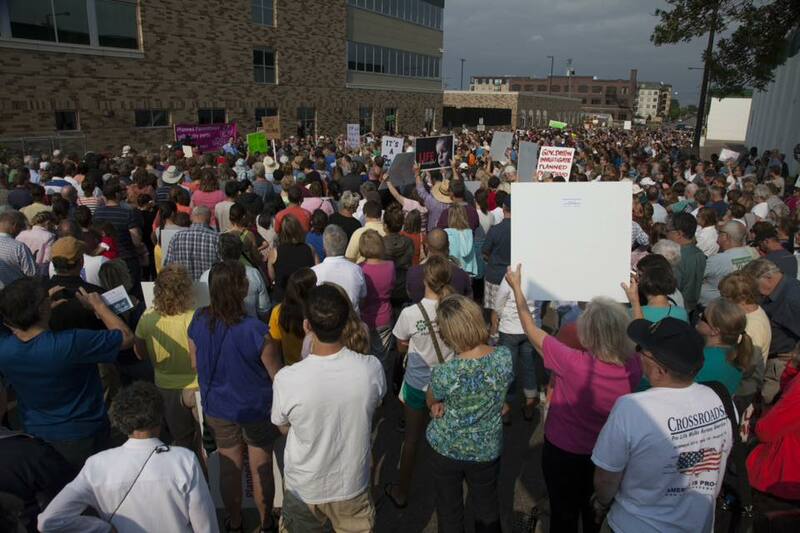 Minnesota Pro-Life Legislators also attended the National Protest of Planned Parenthood in St. Paul! Representative Marion O'Neill (front left) shared a powerful, heartbreaking story about the loss of her young daughter to a brain tumor. She reminds us: "All life is precious. Don't take it for granted!" "Government is given authority by God to do GOD'S business. To do HIS good works. I call upon Governor Mark Dayton who's appointed by God to do good and punish evil. We call on you to be the statesman He's called you to be and do GOOD. What's next? Does Planned Parenthood get away with all this? "The headlines read 'Planned Parenthood Weathers FIRESTORM.' That's either prophetic or it's false. If protesting Planned Parenthood is the only thing you do, then it's prophetic. If this is the beginning of what you do, then it's false. WE need to BE the FIRESTORM!" Will you be part of the Firestorm that exposes Planned Parenthood's barbaric practices, defunds Planned Parenthood, and ultimately makes the "choice" of abortion unthinkable? Men & women of Christ have the responsibility to speak life & truth into their culture, and to restore real hope to women and families. Here's just a few ways to be part of the Firestorm, blazing Light into darkness in Minnesota! 1. Join us for the FIRESTORM Rally at the Governor's mansion on September 9th! We need all pro-life Minnesotans to call on Governor Dayton to investigate & defund Planned Parenthood! 2. Please pray Governor Dayton's heart would be moved, and for Planned Parenthoods in Minnesota (as well as all abortion) to be no more. 3. Call for an end to U.S. taxpayer funding for Planned Parenthood! Use MFC's ACTION CENTER to instantly send an email to your U.S. Representative, as well as Senators Al Franken and Amy Klobuchar, urging them to end federal taxpayer funding of Planned Parenthood. Our system simply matches you with your representative and does the work for you! 4. Call for an end to MN taxpayer funding for Planned Parenthood! Use MFC's ACTION CENTER to instantly send an email to your Minnesota Representative, Senator, Governor Dayton, and Lt. Governor Tina Smith, urging them to end taxpayer funding of Planned Parenthood in Minnesota. Our system simply matches you with your legislators and does the work for you! Published on August 28, 2015 by Autumn Leva.